The first essay of the book is the legendary “An Aesthetic of Reality: Neorealism” in which Bazin traces out the characteristics of this New Italian School in contrast to the existing forms of cinema in Italy and elsewhere (including his views on the use of non-professionals, its advantages and shortcomings). He illustrates why he thinks that realism in cinema more an aesthetic choice than an ontological byproduct and how this “realism” can be controlled to present a world view of the director without being instructive (“But realism in art can only be achieved in one way – through artifice.”). He then proceeds, taking Citizen Kane (1941) and Farrebique (1946) as examples, to elucidate the conflict between using deep focus (which could then be achieved perfectly only in a studio setting) and using real locations (which are cumbersome from the point of view of cinematography) and, hence, proves why every technological advancement that helps bringing cinema closer to reality must be embraced. This is followed by an analysis of Rossellini’s Paisa (1946), arguably the greatest neo-realist film, which studies the episodic narrative of the film, the elliptical nature of its editing and the ambiguity of reality that it offers. This grand opening is followed by extremely insightful, individual essays on key neorealist films such as Visconti’s The Earth Trembles (1948, “La Terra Trema lacks inner fire… no moving eloquence to bolster its documentary vigor”), Fellini’s The Nights of Cabiria (1957, “I even tend to view Fellini as the director who goes the farthest of any to date in this neorealist aesthetic”) and De Sica’s The Bicycle Thief (1947, “Ladri di Bicyclette is one of the first examples of pure cinema. No more actors, no more story, no more sets, which is to say that in the perfect aesthetic illusion of reality there is no more cinema.”) and Umberto D. (1952 “De Sica and Zavattini are concerned to make cinema the asymptote of reality”), wherein Bazin, step by step, clarifies his championing of realism in cinema and his stance that realism in cinema must be concerned only with appearance and not meaning (“Realism is to be defined not in terms of ends but of means, and neorealism by a specific relation of the means to the ends”). Together, these sets of essays make so much meaning, even today, that one is able to see why the photographic property of cinema (and hence its ability to resort to absolute realism) makes it all the more powerful by providing it with the power to reveal the most abstract of philosophical ideas using the most commonplace of images. But what’s really the killer piece of the book is the essay called “The Myth of Monsieur Verdoux”. In this section that runs over 20 pages, Bazin explains why he thinks Monsieur Verdoux (1947) is Chaplin’s greatest work by deconstructing the film part by part and taking it into various levels of discussion. He argues that, in Monsieur Verdoux, Chaplin absorbs from the myth of the tramp, which was developed by him and lapped up instantly by the world, in order to contrast the mute being with Verdoux. He examines how society has, in fact, killed Charlie and how Verdoux is a revenge of sorts for Chaplin. Bazin takes into consideration the whole of Chaplin’s filmography to explore the significance of Monsieur Verdoux, both to Chaplin and to Hollywood. He makes note of the Chaplin’s casting, which seeks out faces that can not only represent and portray the character in this movie but those which carry with themselves their own cinematic histories and mythologies. In the subsequent two essays on Limelight (1952), in one of which he speaks about the emotional impact that Chaplin’s presence in Paris had on critics during the film’s premiere, he examines how Limelight, in fact, takes the myth of Charlie into the realm of Chaplin, by integrating into itself facets from both Charlie’s persona and Chaplin’s life, and pushes the boundaries of authorship to a point beyond with it is impossible to separate the artist from the person. Then there are also some pleasant surprises in the form of shorter essays, two of which deal with the Western genre, its evolution, its cinematic and historical exploration, its transformation following World War 2 and authorship of a director within norms of this genre. There is also one about the birth of the “Pin-up girl” wherein Bazin discusses the philosophy between the ways these posters are designed and later reflects on its relation to cinema. This is followed by two articles on eroticism in cinema and censorship, in one of which Bazin, taking up Howard Hughes’ notorious The Outlaw (1943) as the centerpiece, elaborates on the type of censorship that contained within the cinematic image and argues that it is because of Hays that Hughes was able to take cinematic eroticism to the next level by kindling the audience’s imagination using mere hints, unlike his European counterparts. There’s a lot of humour to be found in these essays (and the earlier ones too) that just adds to the effortlessness and confidence that is palpable in Bazin’s arguments. But, in the final analysis, it is Bazin’s inclination to realism in cinema that is the USP of the book and serves to explain why cinema can transcend other arts in some ways. 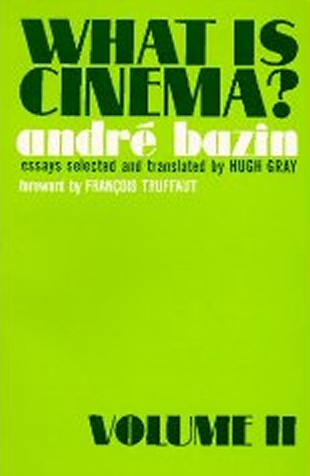 Although this support of Bazin for realism seems to need a revision with the advent of modernist, postmodernist and animation filmmaking, his theories still seem very pertinent and precise as far as conventional narrative cinema is concerned, especially considering the tendency of today’s mainstream filmmakers to move away from realism by imposing a single meaning on the realities of their worlds. I would strongly contend that De Sica’s BICYCLE THIEVES is the greatest neo-realist film, though certainly another look at Rossellini’s PAISAN in the January Criterion release of his three masterpieces in this form will give us another chance to explore Bazin’s vaunted contention. Still, when Bazin contends that “love and compassion” are at the center of De Sica’s cinema he explains basically the wide appeal of the great italain, whose UMBERTO D several years later must surely be counted among cinema’s masterpieces. I am also one who prefers Mizoguchi to Kurosawa, (I also prefer OZu to him) but with Bazin, he admits later here that it’s not a statement of humanity or style, but rather perhaps of taste. (although he dosen’t say that exactly). SANSHO THE BAILIFF (SANSHO DAYU) may well be the greatest film in the entire history of the cinema, a position that Robin Wood actually supports. It’s final scene may be the most piercingly wrenching of all cinematic codas. Of course French critics in general have always believed Mizoguchi to be the greatest Japanese director. I love Rossellini (and Visconti) by the way, but only De Sica (perhaps because of the irresistible emotions he brings) challenges Fellini as greatest Italian director. I have the first Bazin book on my shelf, but not this second, JAFB, so thanks for this truly essential and magnificent post. I have already read though his position on MONSIEUR VERDOUX, and buy much of what he says, though CITY LIGHTS is Chaplin’s masterpieces, and one of the truly great film sof all-time. (MODERN TIMES and THE GOLD RUSH are the strongest runners-up). The statement that Paisa is arguably the greatest neorealist film, here, is actually my opinion. Bazin seems to wholeheartedly agree with your contender here. So would I, almost. Paisa’s strict refusal of sentiment, its to-the-book execution of neorealist principles and its rigorous aesthetics were a revelation to me, compared to the much-talked about Bicycle Thieves (which is one of my all time favorites too, but the joy of discovery was lesser in that). I’m not sure why critics cite Sansho as the greatest. I was swept away by Ugetsu, which I felt was far superior and timeless. I’m seriously Ozu-deficient. Have to start eating Ozu sometime! Hmm, I’ve seen a very few Italian films. I like De Sica and Antonioni very much, but I would like to believe, as of now, that Bertolucci and Rossellini are the greatest Italian directors followed by Fellini (his use of symbols turns me off sometimes) and Pasolini (gotta see more of his works to arrive at a conclusion). THanks for the comments, Sam! I’ve been meaning to visit and comment here on a regular basis after siding with you several times over at WitD. You have a fantastic blog here, and this post about a set of books I’ve wanted for some time is superb. Consider yourself bookmarked, and the recipient of a new found ‘regular’. By the time Verdoux was released Chaplin had been subject to much controversy in the United States, personally and politically, so I can readily understand Bazin’s assumption that the film is “a revenge of sorts.” With many celebrities and political icons Americans have a love affair with placing these heroes or symbols on a pedestal and then proceed to knock them down when they do not act as anticipated. I am old to enough to remember Jackie Kenndy’s iconic status after the President’s assassination and how she was denigrated some years later after marrying Onassis. IMO Verdoux is in the same class City Lights, Modern Times and The Gold Rush. It is a brilliant black comedy, pioneering for a time when there was nothing like it on the screen. I read this book back in the 70’s when I still had not seen many of the films discussed, but having corrected that position over the years, I probably should revisit it. Agree completely. I guess, Verdoux was turned down by the public just because they were reluctant to move away from the likes of City Lights and The Gold Rush or because they could not view Chaplin the artist separately from Chaplin the man.